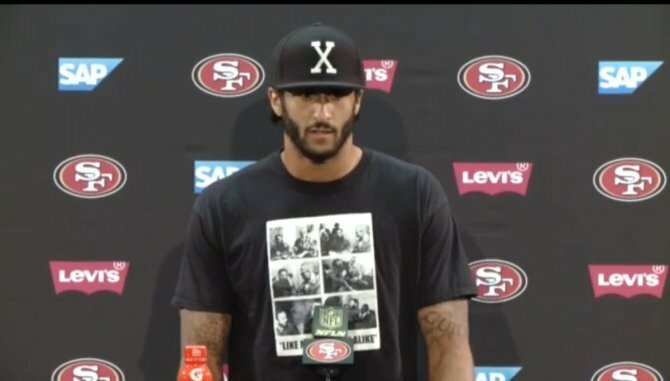 I mentioned in an earlier post that I supported Colin Kaepernick, San Francisco 49ers quarterback, for not standing during the Blood Spangled Banner. I knew it wasn’t an intellectual stance or that he necessarily understood what he was doing or even that he was doing it for the right reasons, but still it takes courage to stand up to patriotic drivel. Now I can no longer support him, because it is clear he’s just a statist idiot who wanted the US government to do more whatever. He was caught defending his wearing of a Fidel Castro T-shirt saying he supported Castro’s “education system”. Pathetic. When a murderer tells educators what to do, it’s not praiseworthy. It’s akin to a murderer rounding up all farmers, killing all but one, telling the lone survivor to plant one orange tree and then people praising the dictator for producing oranges. How many people did Castro kill? How many of them were teachers? How many teachers did he threaten if they didn’t teach how amazing Castro is? Yeah, amazing education system that one. Just in time for the Dolphins game. In Miami, they celebrated as they should. Hopefully the Miami Dolphins, who celebrate Castro’s death appropriately and justrly, will crush Kaepernick who praised this murderer’s central planning. Dolphins just scored a touchdown as I write this. Kaepernick should retire and shut up. Donald Trump, who I never liked, actually said the right thing about Castro. That he was a murderer and how he’s dead and that’s it. One cheer for The Donald. If there is anything good about him, it’s that he doesn’t care about political correctness. This post has been corrected from previously wrong details. A letter my wife got in the mail today has me worried that State medical police are going to be kicking down my door very soon to take away my daughter. I’m not actively worried, but it’s possible. A few months ago she went in to the “Drop of Milk” appointment, טיפת חלב as it’s called. It’s when the State follows up on your kids to make sure they’re still human and get vaccines. At the appointment, they weighed her, and found that she miraculously lost 2 kilograms, even though she only weighs 12 kilos. She also shrunk 7 centimeters, somehow, without us noticing at all. Other friends going to the same place were advised to feed their kids ice cream every day so they could all gain back the weight they lost. Everyone going to this Tipat Chalav were amazingly losing weight. My daughter additionally was shrinking because the nurse put her height in wrong previously. My wife complains that other parents are getting crazy nutritional advice based on faulty scales. The letter we got barely references faulty scales. It was about how, two years ago, we were advised to go to an urgent appointment with a pediatric specialist because our daughter was supposedly too small. In regards to your complaint, an investigation was made into the care that your daughter was given at the Tipat Chalav in Ginot Shomron. The following is what was found upon completion of the investigation. The daughter of Mrs. Farber has been cared for since she was born. At 18 months it was found that she had a significant slowdown in her growth rate, from 5th percentile to below all percentiles. The child was then referred to a pediatrician at Maccabi. (Editor’s note: we don’t even go to Maccabi.) The mother was also given nutritional advice for more densely caloric foods and not the foods that she had mentioned in her letter (referring to the nurse prescribing ice cream to babies on the basis of a faulty scale). With regard to the measurement instruments, complaints should be forwarded to the Ministry of Health directly. We appreciate etc. and we’re dedicated etc. to your etc. Some bureaucratic nurse you’ve never heard of in some central office in Jerusalem whose job it is to fill out meaningless papers that could easily have been stamped and mailed by robots. If the State weren’t so incompetent, they’d take Daf away on the pretext of parental negligence. Today the Supreme Court declared gay marriage legal throughout the US. That’s very good. People should be allowed to sign whatever contracts they want with whoever. The most important aspects as I understand it is that gay couples can now have visitation rights at hospitals, power of attorney, and inheritance rights with whoever they want. At the same time, the Supreme Court has also legalized Obamacare, or a massive theft from the rich to the poor. It will collapse. “Congress passed the Affordable Care Act to improve health insurance markets, not to destroy them,” Chief Justice Roberts wrote in a 21-page opinion, which sounds like it came straight out of Mussolini economics. I have wanted the Fascist government, above all, to give great care to social legislation…I think that Italy is advanced beyond all European nations; in fact, it has ratified laws…for obligatory insurance against tuberculosis…All this shows how, in every detail in the field of labor, I stand by the working labor…from insurance against accidents to the indemnity against illness. Chief Injustice Roberts was on the wrong side of both these issues. He voted against gay marriage but for Obamacare. Sad to see that gay people won’t be enjoying their marriages very much through their new hospital visitation rights when the healthcare system in the US completely implodes because of people like Roberts. I myself am against all state marriage. But if gays want to be taxed more so they can be hassled less on inheritance and power of attorney and visitation, then go for it. The purpose of this post is not to pontificate about how righteous I am. Neither is it to say that everyone should have my standards. I don’t expect that. The only purpose of this post is to spit in the face of Bituach Leumi, which is the Israeli version of Obamacare, and government welfare payments in general. Not the people who take them. Only the people that legislate them and give them out. Anyway, after Fry was born, my wife was forbidden by the State from working. At first I didn’t know that maternity leave was not optional. It is mandatory, ordered by the State. We were just going to forego the maternity leave payments because she works from home and there was no point in taking a break. And I have gone over here many times that we do not accept direct government stipends of any kind. I give our monthly child stipends away to Manhigut Yehudit, as well as the ₪1000 plus shekels we got after Fry was born. There is no way to avoid those payments unless we have a home birth and never register the baby’s birth, which is impossible. Mandatory maternity leave in Israel goes like this: Bituach Leumi pays you, after you hand in a bunch of forms, for three months of your average salary of the previous three months. It’s one size fits all nonsense, especially for my wife. One of her jobs is teaching once a week at University of Haifa Bnei Brak, and there are no classes in July, August, or September, the months where she would be on paid maternity leave. But she’d get payment by Bituach Leumi for those months anyway because one size fits all. She also edits a children’s magazine as well as puts together teacher’s guides. We were informed by the latter company that she could no longer legally be on the payroll. Problem being, the company cannot simply get someone else to edit the magazine because only she is familiar with the work and requirements. So what ended up happening is that she did the work anyway for free for those three months, because otherwise the entire enterprise would have been in danger and she could have had no job to come back to after three months. As for the teacher’s guides, she offered to do them, but since it was illegal, they got someone else (those were easier to find replacements for), and then just let her go. So there goes that income forever, thanks to mandatory maternity leave that makes it unlawful for every woman in this country to be on anybody’s payroll. There was an option for me to take “paternity leave” for 6 weeks to shorten the amount of mandatory maternity leave for my wife to 8 weeks, but since I am technically unemployed in Israel (I work for an American company remotely, and no I do not take unemployment), I could not take paternity leave even though I am home all the time anyway. So much for that. We tried not to take the money and just ignore Bituach Leumi and bite the bullet, she having to work for nothing for 3 months by law, but then the company demanded she pay an insurance premium if she didn’t take the Bituach Leumi maternity money since that is what is required by law, for the advancement of women’s rights and such. It would have cost us even more money out of pocket to ignore Bituach Leumi, so in the end we had to take the money so as not to pay the penalty for ignoring it. So as of yesterday, we received ₪15,219 in taxpayer money to compensate for the fact that it is illegal for women to work 3 months after giving birth, no matter what their situation. Since we do not accept a cent from Bituach Leumi, we decided to give it all away. ₪5,000 immediately went to the Moshe Feiglin election campaign. ₪219 went to a murder victim’s widow whose husband’s death the State tried to cover up as an accident. I would have given her the rest of the money, every shekel, but thankfully for her the State admitted her husband was murdered last week, so she’ll now be taken care of. I now have ₪10,000 left to give away, and I have a plan for it, which you will God willing be hearing about in the coming weeks and months. I would like to reiterate that these standards are entirely my own, and I don’t expect anyone else to hold by my own stringencies. I don’t look down on people who accept tax money for whatever reason. Accepting tax money is not technically a libertarian crime, but it’s something I personally can’t do, to the extent that I can avoid it. I ask not to be tested by God in this regard, because if I actually needed it and my family was starving, I would probably fail the test and take the money. But thank God I don’t need it, and my not touching it will hopefully ensure that I never will. In short, it’s not my righteousness that is pushing away ₪15,219 of tax money that came our way. It’s purely my loathing of the system that gave it to me and my way of seceding from that system and spitting in its face. Thankfully, I’m married to someone who is strong enough to live by my own standards. May the ₪5,000 I gave to the Feiglin campaign be used to get rid of Bituach Leumi entirely, and misogynistic mandatory maternity leave laws in particular, laws that give women NO choice as to what they want to do after they give birth, and in many cases, as in my wife’s, force them to work for nothing for three months. There is indirect evidence that cannabinoids, specifically CBD, help treat Ebola by calming the immune system which overreacts to the virus, causing internal bleeding and death. But since marijuana is a schedule 1 drug with no health benefits WHATSOEVER according to a group of politicians who have no medical expertise WHATSOEVER, it’s illegal, so all Ebola victims can bleed to death for all they care. The Ebola virus also attacks the adhesions between cells caused by the immune Killer cells to release of VEGF (Vascular Endothelial Growth Factor) which result in the destruction of the Tight Junction between cells and causes a fluid leakage between cells until bleeding occurs. The inhibition of VEGF by cannabinoids prevent the cellular junctions from haemorrhage. Cannabinoids Inhibit VEGF and inhibit Glioma brain tumors growth by this mechanism. (6) It is reasonable to predict that inhibition of VEGF and other Cytokines by Cannabinoids during an Ebola infection will help the survival of this deadly disease. (6 and 7) Stopping the release of Cytokines will be a key feature of treatment of this deadly disease. It’s a dumbfounding experience speaking to a man who really believes that the State exists to take care of people, that it is trustworthy, that if only some law were passed so taxpayers could fund just one more thing, everything would be fixed. The statist believes in force. He believes in laws. He fears liberty. He thinks it will lead to chaos. He does not trust the market, he has a low view of man, but paradoxically, believes a man-run State is somehow exempt from the low status of mankind he has bestowed upon the tax paying portion of the population. The tax parasites, those are the noble ones, living off the productivity of others like leaches. In one conversation with a statist who is some sort of researcher or teacher at a medical school , I accused him of supporting taxpayer subsidies because he is part of the two most heavily subsidized industries – healthcare and higher education. He responded that most of his money comes from “private research grants” rather than tuition from indebted students that get their money from government loans. There’s always a way to weasel out and say you’re clean. Private research grants probably from Big Pharma companies that have spent millions lobbying congress for extra regulations and hoola hoops and barriers for smaller companies from entering the industry. Let’s see one small cap company successfully break through the insanely expensive phase III FDA barrier without Big Pharma lending a “helping hand” and securing revenues for itself. Private research grants…fah. What he means is research grants given by huge conglomerates that have special corporatist privileges from government. He’ll read this, deny it, say the money is clean because it comes from pure capitalists who are not in bed with government, which will then contradict his whole value system because, of course, he is supposed to love government and hate pure capitalists as greedy pigs. With what money are you going to make medical school free? Who is going to pay for it? The Feds, who are in the hole over $100,000,000,000,000 in unfunded liabilities? This is what I can’t understand about about you people and it brings me almost to tears. Don’t you get it? There is no more money. It’s all gone. How the hell are you supposed to make medical school free? The answer is you force people who don’t want to go to medical school to subsidize people who do want to go to medical school, more theft. You say the trillion dollar student debt is unfair, and they you have the chutzpah to suggest free medical school? Do numbers mean nothing to you? Or do you just ignore them? Does your brain turn off when you hear the debt? Do you think it’s fake? What do you think is going to happen when the debt cannot be paid? All the trillions of dollars of treasury bonds are going to flood American shores. The dollar will collapse completely. All your savings will be wiped away in a few months. You won’t even be able to afford to buy food and clothing, let alone “free medical school”. My God. You can’t see it. You think money is pieces of paper. Go ahead, enjoy your free medical school. The debt is just a fairy tale after all. That you ask the question shows that you don’t know how the US health care system works, or the numbers involved. The total cost would be under $5 billion annually. The savings from a single drug — Lipitor — going generic would have paid for it. And it would dramatically reduced costs in the long run. As I pointed out, taxes aren’t theft. Period. About 40% of it is in fact fake, as the US includes debt held by government agencies in the national debt calculations. If you eliminated the national debt as it is typically defined, you would also eliminate 96.5% of the US currency in circulation, which would be catastrophic for the entire planet. The only reason the debt won’t get paid would be if the Republicans refuse to raise the debt ceiling or shut down the government. Japan’s national debt as % of GDP is more than double that of the US, and nobody is ranting the way you are about its solvency. The problems in the US are political, not fiscal or economic. And attitudes such as yours are a major part of the problem. So let’s break down this bull. I can picture some senator saying that right now. It would sound beautiful. Just one more law will fix EVERYTHING! I know where I’ve heard that line before. From FDR, when he started Social Security. Huge savings. Little cost. Nothing to worry about. And LBJ when he started Medicare. Huge savings. Little cost. Nothing to worry about. And George WTF Bush when he wanted to bomb Iraq. Little cost. In and out. Huge oil savings. Nothing to worry about. Now both programs encompass HALF THE ENTIRE FEDERAL BUDGET OF OVER $3 TRILLION DOLLARS. And Iraq cost over $1 trillion MORE. You know what’s going to happen when medical school becomes “free”? Here’s what would happen. The government would be ecstatic that it now has a whole NEW chunk of the economy, medical schools all over the country, under its tight satanic grip. With all the money now in the hands of disgusting politicians trained to squeeze money out from wherever they can, Senators from states with “underprivileged medical schools” would get lobbied to increase the taxpayer funded budget for the medical school in their state. Commercials from doctors unions would be run “decrying the horrible state of medical education” and there’d be an emergency 2am vote in the Senate to double the national medical school budget and make sure our “national medical education infrastructure remains safe for future generations.” Then inside that bill doubling medical school spending, you’d have 50 porkbarrelled riders adding gyms and saunas “off budget” to the medical schools where you have the most relatives of senators. Then you’d start the campaign to expand the medical school student population for the underprivileged, inner city poor kids who have no shot of getting out of the ghetto unless they go to medical school. We have to include all of them, so we have to expand the budget. Let’s double it again and bring in at least 30% minorities. Any medical school that doesn’t bring in at least a 30% minority student base has its budget cut and subsequently spent on the next stupid “War on Terror” horror episode. Any school that brings in a higher percentage gets increased funding. A huge government contractor now wants a new project. He has a friend high up in some medical school close to Washington. The friend wants to give the contractor a job building a new platinum encrusted wing in memory of some politician’s great niece to a medical school. So the friend says to the government that without a new wing that will cost at least $30,000,000, the quality of medical education at his institution will decline precipitously. He knows the exact man for the job. Ride it onto some spending bill. Sounds good. Soon all the medical schools want new wings dedicated to more politicians. The budget balloons. And so on and so forth. $5,000,000,000? And how much was social security and medicare supposed to cost? $1.6 trillion of course. And counting. Feh. Savings. That’s what the government wants to do. Save you money. That’s why they’re the most indebted institution to ever have existed on planet Earth. Because they want to save you money, that’s why. Perhaps it’s because they like spending money they extract from you? Just a thought. Why even get into the aspect of inter-government debt and it being a fiction? He doesn’t understand what debt is. According to him, since the government owes the government, it’s all fake. Ha, that’s a good one. Here’s a reductio ad absurdum. Joe of planet Earth owes Bob of planet Earth $16 trillion dollars. But since they’re both of planet Earth, Earth owes it to itself, so the debt is fiction. Sounds good to me! Let’s keep spending! And as long as we can keep upping the debt ceiling and borrowing more money to pay off money we already borrowed, everything will be fine! Nothing’s going to crash! This isn’t some sort of positive feedback loop! Interest rates will stay at historic lows forever! Nothing to see here! Just keep spending! Once we decide that health care is a fundamental right, then implementing it is only a question of finances. He is correct of course. If health care is a right, then government has the responsibility of providing it. The game then becomes how. The problem is his premise. Health care is not a right. The reason health care is not a right is that it requires somebody else’s services, and nobody has any right to anybody else’s services. Suppose there are not enough doctors to provide enough health care services to everyone. If everyone has a right to health care, then by extension the government can force people to become doctors who do not want to be doctors. If everyone has a right to health care, then the government should make statistics regarding how many doctors the State needs to treat X amount of people. Factor in population growth, and medical schools will be forced to graduate a certain quota of doctors at minimum to provide for everyone else’s right to health care. If they fail to meet this quota, the administration should be put in prison for not providing for other people’s fundamental right to health care. Universities, by extension, will be forced to have X students take pre-med courses. If they do not meet their quota, the will have to force students who do not want to take pre-med courses, to indeed take them. If they don’t, these students should go to prison, because they refuse to provide for other people’s fundamental right to health care. You can see here that assuming health care to be a fundamental right interferes with the actual fundamental right to liberty. People actually DO have a right to be free, and not imprisoned because they do not want to provide for other people’s health care. Life, liberty, and equal treatment under the law are the only fundamental rights we have. They are fundamental rights because we were all created equal by God, and God created us to be His servants, not man’s servant. The right to one’s life is not the right to take something from someone else. It’s the right to not have something taken from you. The right to one’s liberty is not a right to take something from someone else. It’s the right to not have something taken from you. The supposed “right” to health care is indeed the right to take something from someone else. If we assume health care to be a right, then life and liberty are gone. Health care is a service. It must be payed for voluntarily like any other service.